Bertha and Magda are complete opposites but the best of friends, when Annie "Bessie" Monroe comes to town their relationship is threatened. Bertha is taken with "Diamond Bessie" and quickly asks for her advice in wooing Thaddeus Bloom, her long time crush. But what Bertha doesn't know is that Thad is about to leave her to attend college and is having a hard time finding the courage to make a decision about her. The arrival of Annie and Abe make things worse and when a body is found in the woods things change forever in Jefferson, Texas. 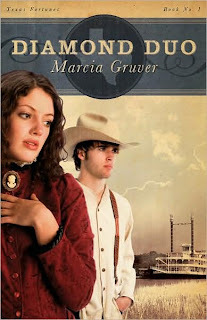 This is the second book that I have read by Marcia Gruver, I read book 2 first because I won it on a blog, reviewed it, and the author was nice enough to send me this one! I found Diamond Duo to be a good story even though it took me a few chapters to really get into it. Bertha and Magda were great girls! I loved how they fought in the middle of the street like boys in a school yard. I was a bit of a tomboy (still am I guess) and can't remember ever going at it with my friends like those two did! I also liked Annie, I really felt for her because I know a lot of girls who are in tough relationships like she was. It was great that in all the sadness and seriousness she did get to have some fun with Bertha and they both threw caution...and corsets to the wind at Lover's Leap! All in all I liked this story and would recommend the series, book 2, Chasing Charity is my favorite of the series so far. I haven't had the chance to get book 3, Emmy's Equal but I will because I'm sure it is a nice ending to the Texas Fortune's series! I think I have book 2 on my shelf right now, and I'm glad to know that they can be read out of order. :o) But...also glad that you liked book 1, too! She's one of many newer authors that I need to try out. I thought it was a little weird that so much time passed between books 1 and 2. It was so long in between me reading them, that at first I couldn't figure out what in the world was going on in Chasing Charity! I liked Diamond Duo okay, but I agree, Chasing Charity is my favorite of the series. Emmy's Equal is okay, too. I can't wait to see what you think about it.